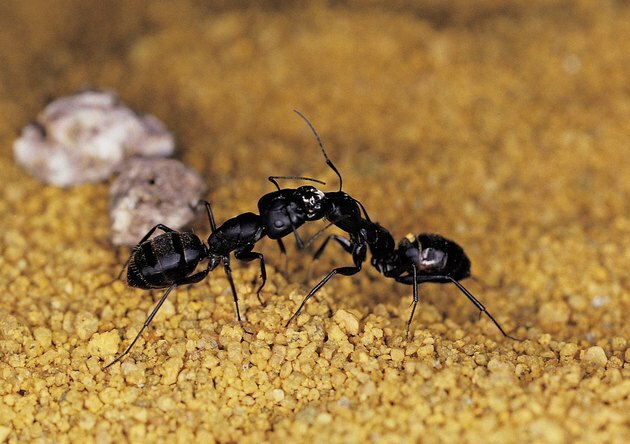 Ants are a nuisance that almost all homeowners face at some point. Ants are hardy creatures and can quickly move their entire home at the first sign of danger, making it difficult to exterminate them. While laundry detergent may seem like an unlikely ant killer, it poisons the insects and, if used correctly, can completely wipe out their colony. Some uses of detergent may be harmful to pets and children. Laundry detergent quickly poisons ants. Locate anthills. Mix equal parts of powdered detergent and boiling water into a bucket. Pour the liquid into the anthill. The water will flood the hill, and the detergent will poison the ants. Mix equal parts of detergent and water. Apply the solution along the foundation of your house and any locations where ants are known to gain entrance, such as window seals. The solution will discourage the ants from entering your house and kill those that attempt to. You may also use the solution in a spray bottle and spray any roaming ants that you see. Mix equal parts of liquid or powdered detergent and sugar water. Pour a bit of the solution where ants are entering your home. The ants will be tempted by the sugar and take the poisonous detergent back to their home, poisoning the other ants.